HouseOfMuscle.com opened in 2003 and I started offering a FREE House Of Muscle T-Shirt to customers in 2005. I still say now, as I said then, I can not guarantee a House Of Muscle T-Shirt will help you lift more weight when you work-out, but you'll sure look good doing it! Back in 2005, the first House Of Muscle T-Shirt I offered was gray. 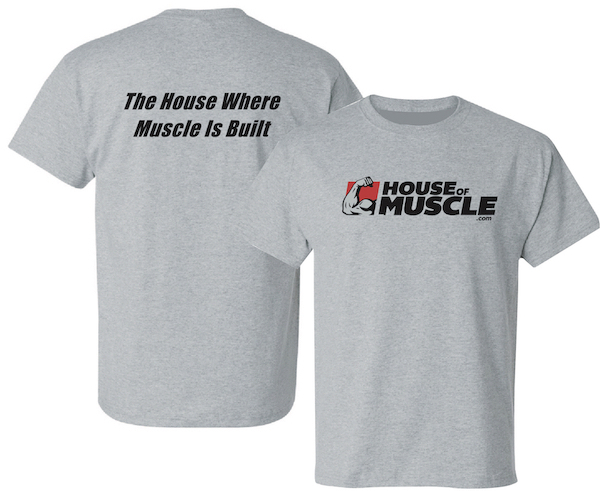 It had the first HouseOfMuscle.com logo (which we used from 2003 to 2015) on the front and on the back it proudly displayed our slogan, The House Where Muscle Is Built. I have decided, this time around, to go back to the "old-school" gray color from 2005. The back will still show that you are in The House Where Muscle Is Built, but on the front is our current HouseOfMuscle.com logo. The new shirts are available for sale at The House Where Muscle Is Built for $15.99. But you can get our new HouseOfMuscle.com T-Shirt for FREE on any order over $60. It is hard to believe that it has been over 14 years since I proudly wore a HouseOfMuscle.com T-Shirt for the first time. I was proud of the company the T-Shirt represented then and I am still proud of the company it represents today. HouseOfMuscle.com is The House Where Muscle Is Built. HouseOfMuscle.com will always continue to strive to bring you, our valued HouseOfMuscle.com customers, the highest quality, truly effective and low priced sports nutrition supplements. Some people might say, "It is just a free T-Shirt. What's the big deal". They just don't get it. Our new, FREE T-Shirt represents what our business is all about, who you are, and what you are trying to achieve. HouseOfMuscle.com is The House Where Muscle Is Built. As a valued HouseOfMuscle.com customer, you are IN THE HOUSE. All you have to do to receive your new, FREE HouseOfMuscle.com T-Shirt is place an order for the high quality, truly effective and lowest priced House Of Muscle supplements at HouseOfMuscle.com. If your order is over $60, your shipment will include your new, FREE HouseOfMuscle.com T-Shirt. Just click YES, that you would like a FREE HouseOfMuscle.com T-Shirt and then specify your size (we offer M, L, XL, XXL and XXXL) during our secure online ordering process. I truly appreciate your business and we sincerely hope offering this new, FREE HouseOfMuscle.com T-Shirt shows this appreciation. Let's all continue to fight the good fight as we battle to build the lean, hard, muscular and strong bodies we desire. Copyright - 2003 - 2019 HouseOfMuscle.com® House Of Muscle® All Rights Reserved. House Of Muscle® is a registered trademark owning all rights to use the words HOUSE OF MUSCLE (or any variations thereof, including "The House Of Muscle") on T-Shirts and Apparel. Any use of this right, without the expressed written consent of HouseOfMuscle.com, LLC, is strictly prohibited. Disclaimer: This offer is for a limited time and can be discontinued at any time without warning. To receive your FREE HouseOfMuscle.com T-Shirt, just place an order with our secure online ordering system (make sure it is over $60). Then answer "Yes" that you would like a FREE HouseOfMuscle.com T-Shirt and enter the size of the HouseOfMuscle.com T-Shirt you want. Sizes available are M, L, XL, XXL and XXXL. If you do not answer "Yes" that you would like a FREE HouseOfMuscle.com T-Shirt and enter the size you want, you will not receive a FREE HouseOfMuscle.com T-Shirt.